We're No Angels opens on Christmas Eve, 1895. in a small coastal town where three fugitives are hiding out, having just escaped from Devil's Island prison. As a brief aside, I kind of love that this movie was set exactly 60 years before it was made, and we're watching it exactly 60 years later. The fugitives find their way to a shop with a leaking roof, which they offer to fix as a ruse to rob the place. From the roof, they hear the shopkeeper talking with his wife and daughter, and piece together that the family is trouble. The store isn't doing well, and the owner, who is the shopkeeper's cousin, is coming to inspect the books. The criminals gradually change their plans, using their talents to help out the family instead of themselves. From the premise, it shouldn't be surprising to hear this was based on a play. Aside from a brief intro and epilogue, the entire movie took place in the shop and attached home, and the cast list is a short one. Pull out a couple characters with less than a minute of screen time, and you're really left with eight characters. Nine if you include the convicts' pet snake, who never appears on screen. 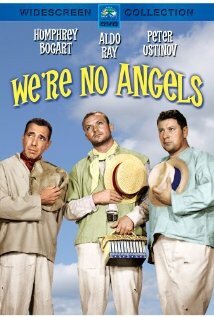 Apparently, We're No Angels's claim to fame is that it's a comedy starring Humphrey Bogart, who generally steered clear of the genre. In addition, Basil Rathbone costars as the aforementioned cousin/antagonist. It's a strong cast, all around. Over all, we found this charming and funny, though it definitely dragged at times. The convicts were surprisingly charming, given how far the movie was willing to take them. These weren't wrongly accused or misunderstood men: two of the three were murderers, and the third expressed regret when he learned the guard he'd wounded escaping survived. This was definitely on the dark comedy side of comedy, and the "gifts" they brought resulted in a few deaths. Holiday elements were integrated throughout in the setting, plot, and premise. The convicts were compared to angels on a couple of occasions, a parallel which was contrasted quite beautifully with the fact their solution to the family's problem involved manslaughter, if not outright murder. The fact that this was, in the context of the movie, a moral action, made for a wonderful twist on a Christmas story tradition. As I said before, the movie felt long in places, especially in the first half, and some of the dialogue coming from the family gets stilted and cheesy. It's also worth noting that some of the subversive comedy could bother modern audiences. For example, there's a string of jokes where sexual assault is implied: they never take this too far, but it's definitely part of the subtext. It's difficult to hold that against the movie. The point is to be subversive, to take criminals and force you to like them, despite their flaws and crimes. And I have to applaud the movie for not going to the easy route and making their crimes and philosophies justifiable, even if it means a handful of uncomfortable jokes. It's mainly the movie's pacing issues that make me hesitate to recommend it without exception. It's still quite good, though, and... I really don't want to give this one away, but I can't overstate how much goodwill this movie got from me for its last shot. That was really quite brilliant. If you're a fan of the talent involved or the era, or if the notion of a dark comedy made in 1955 is just too intriguing to pass up, you should absolutely track this down. I'm not sure it's for everyone, but it's a fun little movie.